Customers need to recognize how a proposed feature will work. But simply describing to them verbally or textually for the targeted feature to be built may be quite challenging for their imagination. Wireframing can be extremely helpful in squaring that circle, as it can be served as a "show, don't tell" visual mock-up tool for confirming system design ideas with customers. The wireframe tool comes with rich editing functions. Wireframes can be created with just a few mouse drag. Wireframes can be structured in a 'tree'. Changes made in parent are instantly propagated to its decadence. No more rework on similar wireframe drawings! 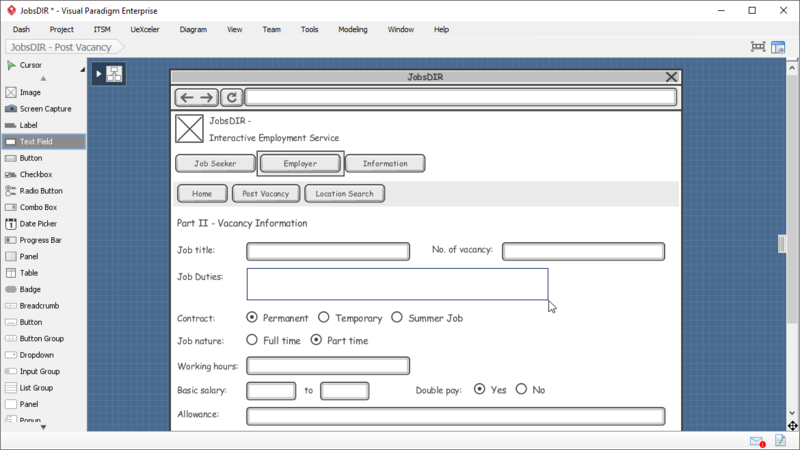 In system re-engineering, use the screen capture tool to take a snapshot of existing system screen, convert part of it into wireframe components and mark the changes. Traceability is also maintained. 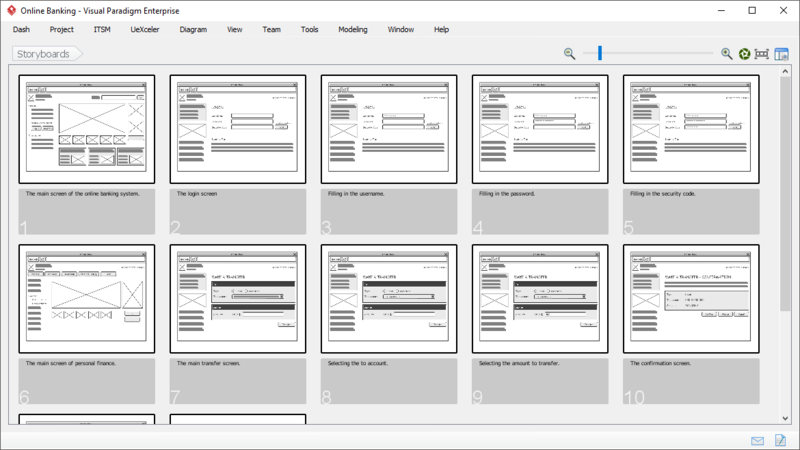 The storyboard tool allows you to put together relevant wireframes into a meaningful storyboard, and play them in sequence. This allows you to communicate system design ideas with stakeholder easier. This wireframe example demonstrates the use of annotations in screen mock-up. 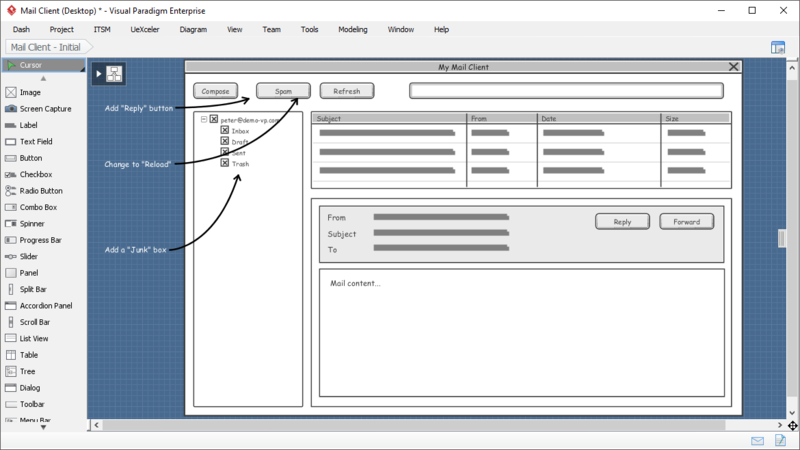 The wireframe tool also features use case and agile tools. Wireframes can be seamlessly integrated into a use case's flow of events. Besides website wireframe, we also support a range of wireframe tools for different devices: Desktop application wireframe tool, Android wireframe tool, Android tablet wireframe tool, iOS wireframe tool, iPad wireframe tool. Easy to draw: Wireframe has a simple and clean layout. It is formed by simple screen elements without any detailed styling and formatting. 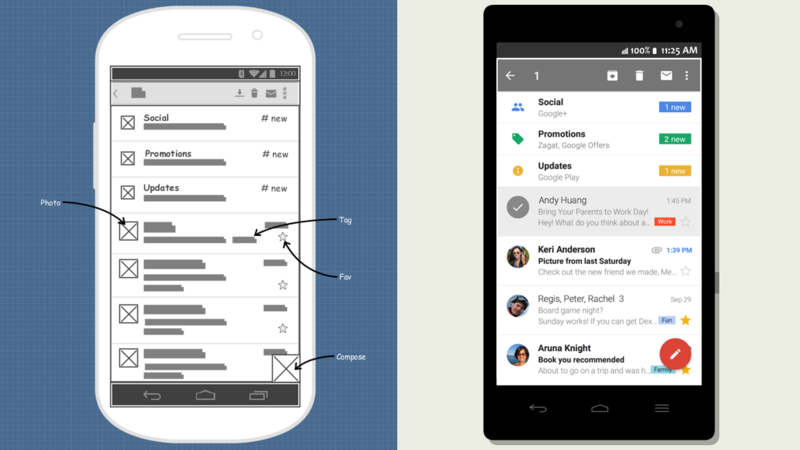 Easy to modify: You don't need any programming to visualize new design ideas. Why Wireframing with Visual Paradigm? Visual Paradigm's wireframing tool is so intuitive that helps you mock-up much Faster & Smarter. Sketch-style wireframes encourages brainstorming and focus the conversation on content and interaction rather than the detailed design of the user interface. In addition to website wireframe tools, Visual Paradigm's wireframe toolset features different devices style (tablet, desktop, iPad, iPhone and Android) with different components or orientation at your choice. 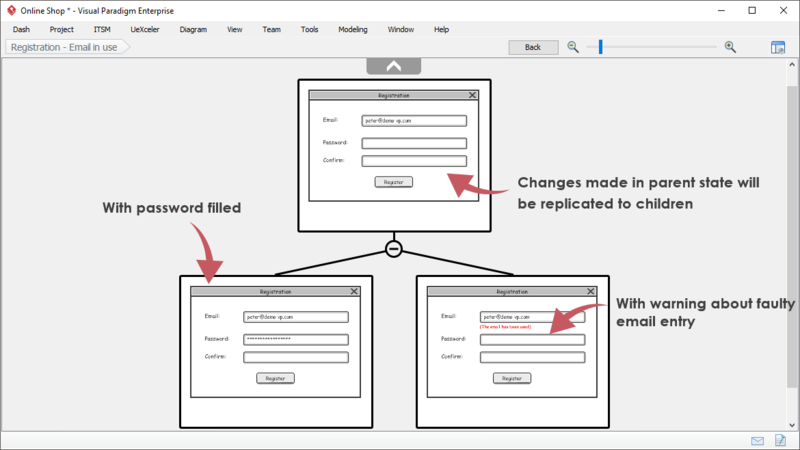 Wireframes can be modelled as parent and child frame relationship for more effective editing and management. Changes are synchronized to child frames instantly. No more rework is needed! 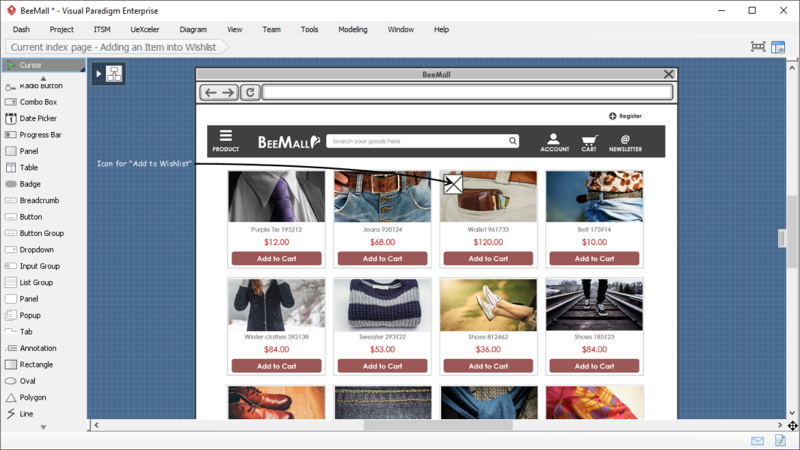 Embedding screenshot in wireframe is so convenient by using the build-in screen capturing tool. Wireframes are seamlessly integrated with use case and agile user story scenario modeling process, complementing the concern of UX in requirements gathering. Playback viewer enables you to shows storyboard as a series of cross device wireframes in screen flow. Customer knows how the proposed working software is supposed to be behaved or in-action. We are trusted by over 230,000 people in companies ranging from small business to Fortune 500 companies, universities and government units.